Cable percussion drilling is a tried and tested method of site investigation. The drilling technique allows the installation of casing inside the borehole to prevent loose soils collapsing into the hole, allowing the borehole to be advanced to considerable depths while maintaining good progress. ‘Clean’ drilling techniques can be utilised with the provision of different sized casing to prevent contamination in the near surface strata from affecting deeper strata. This is especially important on sites with high concentrations of mobile contaminants. In-situ testing can be undertaken in the borehole including Standard Penetration Testing (SPT), borehole vane testing & permeability testing. Disturbed samples are taken from the borehole by the drillers for logging by an experienced geoenvironmental engineer. Undisturbed tube samples are also recovered for laboratory testing. 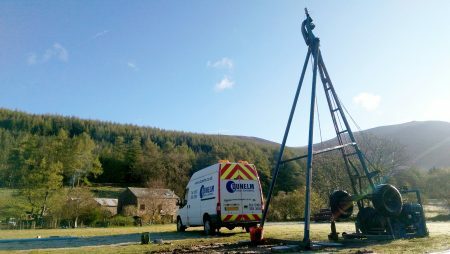 On completion, gas and groundwater monitoring pipes and geotechnical monitoring equipment can be installed in the borehole to allow later measurements by our dedicated technician. Dunelm have four cable percussion rigs available, as well as access to specialist rigs which are suited to restricted access sites. The rig is towed into position using a Land Rover, meaning that these rigs can be used in most locations where there is sufficient space; a considerable working area is required however. The rigs are fitted with lifting points enabling them to be moved into position by a crane on difficult sites or onto an overwater drilling platform. Boreholes can be drilled at a variety of diameters including 150mm, 200mm and 300mm. Larger size casing can be obtained when required. Brief details of our rigs are shown below. Standard cable percussion rigs used extensively in the site investigation industry and ideal for most drilling projects. More powerful version of the Dando 150 cable percussion rig, suitable for drilling to depths of over 50m in suitable conditions.